As I mentioned in last week's post on the MarTech Conference, there appears to be an emerging class of vendors doing what might be called “journey management” – although I think I’ll rename that “journey orchestration” since (a) orchestration is a trendier term right now and (b) orchestration more accurately reflects the key notion of a system that coordinates other systems. * This coordination includes both gathering data from multiple sources and sending messages through other systems. Sending messages distinguishes journey orchestration engines from “pure” Customer Data Platforms, which assemble data but don’t make decisions about customer treatments. Some not-so-pure CDPs do combine the data assembly and decisioning, but they don’t use a system-assembled customer journey as the framework for message selection. - By “system-assembled customer journey” I mean the systems automatically derive a customer journey from the customer data they’ve assembled. That’s quite different from pre-defining an ideal customer journey and trying to force customers to follow it. It’s even more different from taking conventional multi-step campaigns and calling them "journeys”. A true "system-assembled journey" would be built by examining the sequence of events for each customer and finding the most common paths to purchase. This still isn't a purely objective process because some human or machine judgement is still needed to exclude irrelevant details, assign interactions to journey stages, and select the most important sequences. But it's much more data-driven than starting with an marketer-created design. Ok, let’s assume you’re now convinced that “journey orchestration engine” has a specific meaning that describes something useful. Your next question, presumably, is where can I buy one? (Oh, you’re not that easy to sell? Listen closely: It’s new. It’s bright. It’s shiny. New. Bright. Shiny. Newbrightshiny. Now are you ready to buy? I thought so.) My blog post listed three vendors from the MarTech show: Pointillist, Usermind, and Thunderhead. I promise I’ll review those soon. But I had already spoken with another relevant vendor before the show, Hive9. So let’s start with them. If you look at Hive9’s Web site, you may wonder whether I’ve sent you to the right place. They position themselves as “marketing performance management” with no mention of anything resembling journey orchestration. That’s because Hive9 actually has three connected modules: one for marketing planning, one for marketing measurement, and one for optimization (which is what I’m calling journey orchestration). These were all developed within B2B marketing agency Bulldog Solutions, which spun off Hive9 about a year ago. The planning module was the original product. It lets marketers set up a hierarchy with plans at the top, going down to programs, campaigns, and tactics. Tactics have owners, budgets, start and end dates, revenue targets, types (usually a channel or asset) and other attributes such as journey stage, audience, business unit, geography, and language. These can be tailored to each client. Tactics can be tied to Workfront for project management, filtered on pretty much any attribute, and displayed on a Gantt chart-style calendar. Integration with Oracle Eloqua and Salesforce.com lets a new tactic automatically create a corresponding campaign in either system. Each plan can have a marketing funnel with its own set of stages and targets for conversion rates, velocity, and deal size. The measurement module reads information from plans and imports revenue, accounts, opportunities, and contacts from CRM, marketing automation, and other systems. Standard integrations are available for Salesforce.com, Oracle Eloqua, Marketo, Google Analytics, Adobe Marketing Analytics, and other systems. Other sources can be integrated through API connections or flat file imports. The system relies primarily on customer identifiers provided by source systems although it can stitch together identities when different systems share some IDs. Once the data is loaded, the measurement module provides dashboards and other reports to show marketing results including revenue impact; counts, conversion rates and velocity by funnel stage; and whatever other data the client has integrated, such as social sentiment or customer satisfaction. Revenue impact can be measured with first-touch, last-touch, evenly-weighted, position-based, and several other algorithms. The vendor plans to add statistically inferred weights in April. Results can be filtered by plan, audience, tactic type, assets, or other attributes; compared across time periods; and examined for trends. Dashboards are customized by the vendor for each client, although Hive9 plans to add self-service capabilities in the future. The optimization module is where journey orchestration happens. Journey stages are defined within the optimization module. Tactics can be tagged directly with stages, or stages can be assigned to assets which are themselves assigned to tactics. Events or assets managed in other systems can also be tagged with a journey stage and channel. However the connection is made, campaign responses are tagged with channel and journey stage and then assembled into a journey map. 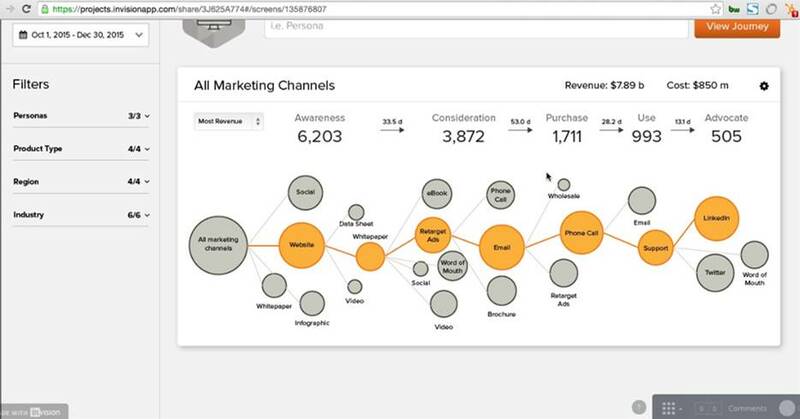 The map shows the number of interactions by channel and stage and highlights the most common path taken by buyers. This isn’t fully automated journey mapping because the stages are preassigned by the marketer. But the system does discover the most popular paths and most effective marketing assets on its own. So that’s pretty close. Even more important, the optimization module can contain rules that trigger external marketing campaigns when a customer enters a given journey stage. This is what really qualifies Hive9 as a journey optimization engine. Here's how it works: users can set up a rule tied to journey stage, product type, or customer attribute such as industry or persona. Customers who qualify for a rule can be sent to specified marketing automation campaign. Rules can avoid repeating messages to the same person and can select a “next best message” for the external system to deliver. This definitely qualifies as journey orchestration. Hive9 pricing starts around $25,000 per year for mid-market clients. Modules are priced separately. Fees are based on the size of the company marketing budget for the planning module, on the number of records, dashboards, and data sources for the the measurement module, and on the number of touchpoints for the optimization module. * Also, this lets me call systems that do this “journey optimization engines”, giving a three letter acronym of JOE, which is so darn cute. ** You may notice that “journey optimization” sounds a lot like what I’ve previously called “state-based marketing”. Both do select marketing treatments based on a customer’s location within a state/stage framework. If I had to draw distinction, I’d say that journeys suggest forward progression from one stage to the next, while movement among states is not necessarily linear. Similarly, journey orchestration engines send marketing messages through other systems, while state-based systems could use internal or external delivery functions. In other words, journey orchestration is a special type of state-based system. I think I’m still technically on the advisory board for this conference, so I thought I’d share some thoughts. To encourage input from the larger community, I’m posting it publicly on this blog. You’re welcome. Over-all, the conference went tremendously well. Attendees I spoke with were uniformly pleased with the quality of the presentations. The closest thing I heard to a criticism was that some sessions were more theoretical than action-oriented, but that is really a matter of taste. One person told me he liked the case studies best; no surprise there. Someone else said they were surprised at how many had a B2C focus, although that was more an observation than a complaint. The only frustration I heard consistently was having to choose between two interesting sessions when they were on at the same time. From my own perspective, the worst thing was that no one laughed at the cave man joke. Unga bunga bink! I did feel the exhibit hall was more crowded than optimal, although some vendors seemed to like being able to grab attendees as they walked by. I’ll also complain that many vendors lacked signage that explained what they did – not your fault, of course, and maybe a conscious strategy to force people to engage? Perhaps we could have one of the automated content generation vendors read all the vendor materials and write optimal signs for them! On to suggestions for next year. I expect you’ll go to even more tracks, which will make it still harder to choose which to attend. Video recordings would let people catch up on sessions they missed; if that’s too expensive, voice recordings to accompany the slides would be a big help. Maybe a better delineation among the tracks themselves would help too. I’d love to see a track of sessions analyzing product groups within the big landscape: i.e., one for marketing automation, one for content marketing, one for marketing analytics, etc. That would also be a good way to segregate analysts like me from people who want to avoid them. You might also have separate technology and organization tracks and maybe even have an ad tech track (a very underrepresented topic this year). If things get really big, you could also split B2B vs B2C or enterprise vs. SMB. The idea would be to find categories that are more or less mutually exclusive in terms of their audience, although of course some cross-over would be expected and a Good Thing. Another way to help people with narrow interests would be to have special interest groups, such as ‘birds of feather’ tables at lunch or open-mike roundtables during sessions. I could see tables for CMOs, CMTOs, CTOs, marketing ops, newbies, and other peer groups with their own sets of challenges. Or maybe separate bar set-ups during the receptions. I could also see some more conventional competitions in the exhibit hall. These would be team sports, so you could have marketing vs. IT, big companies vs. little companies, vendors vs buyers, etc. Or maybe mixed teams to practice their alignment skills. Picking a sport is tough: foosball is obvious but might give an unfair advantage to the IT folks. We could balance that with something that marketers are especially good at – maybe darts, which I believe are still the standard tool for setting media budgets. Just a thought. There’s always Powerpoint karoke, although that’s best for after hours. Or let’s get really high tech. We could have a speech recognition vendor listen to the presentations and score them for buzzword bingo. Or, at least, do a word cloud of what people are saying, either in speeches or in Twitter comments. We could have a competition among speakers for the most Tweets (although I guess that already happens). Back to team sports. How about teams of attendees competing to create the most successful marketing campaign during the conference? We’d have vendors create preintegrated stacks with tools for research, content creation, campaign execution, optimization, and analytics. The vendors and team members would design, execute and optimize their campaigns, which shouldn’t take much time if the systems are really efficient. Two days is enough time to get some initial results. The campaigns could be for imaginary products or, better still, for worthy charities. Attendees could form their own teams or we could let something like CrystalKnows profile them and then assign attendees to teams with a good balance of skills and personalities. If that’s too complicated, we could do a standard bake-off competition where vendors and novice users are given a simple task (e.g., create an survey or dynamic email) and do it while everybody else watches and then votes on the results. MarTech Madness hit this week in San Francisco as 1,200 delighted marketing technologists escaped from their cubicles to cavort under the genial gaze of @chiefmartec Scott Brinker at the latest MarTech Conference. My own experience was a bit skewed because I was pulled into many side meetings, but the attendees seemed pleased and the sessions I did attend were excellent as always. MarTech is unique in its focus on the process of marketing technology management, with sessions covering organizational, staffing, and training issues even more than the technology itself. It’s also unusual in attracting people from both B2B with B2C companies, two groups that rarely mix. As usual, I spent much of my conference time prowling the exhibition booths. I was struck by the number of content-related exhibitors – nearly half, based on my analysis of the conference program. Many of those were doing standard content management tasks such as workflow, approvals, and repository management. But several offered some kind of interactive content, which I’d define as content that captures information about the user either through recording behaviors or explicitly asking for input (HapYak, ion interactive, LookBook HQ, SnapApp, and arguably Uberflipand Vidyard). This is a category that also caught my eye at the Content2Conversion conference last month. Two mentions officially makes it a trend. There were also several vendors doing what I’ll tentatively call “journey management” (Pointillist, Usermind, Thunderhead [represented at the conference by its partner Arke], and arguably IBM Journey Designer). These resemble conventional campaign managers but execute campaigns based on movement through a comprehensive journey map. These products differ from the earlier generation of journey managers in being tied to live customer data and execution systems, rather than simply drawing a map. There’s considerable variety among these vendors so I need to analyze them more closely before I can confidently call them a meaningful category. But seeing several products emerge simultaneously with similar features is usually a sign that something interesting is afoot. As these observations suggest, many of my conversations during the conference – especially after the bars were open – related to the ever-popular game of What’s The Next Big Thing? The spotlight has clearly moved from predictive analytics. ABM is still the current focus but it’s starting to feel dangerously familiar. Interactive content and journey management are definitely candidates, but the consensus at the deepest (and best lubricated) discussion seemed to be what you might call user-tuned content* – that is, content that adjusts to the viewer’s behavior, presumably using artificial intelligence to choose what to do next. That’s different from capturing behaviors with interactive content, as described above, although the same system could do both: in fact, I'd put LookBook HQ in both categories. "User-tuned content" appeals to me in part because my own MarTech presentation was on machine intelligence, and one strand of development I foresee is combining systems that recognize an individual customer and select the best product or offer (e.g. Evergage or BlueConic); identify the customer's persona (e.g. CrystalKnows, Mariana, CaliberUX); and automatically write data-driven content tuned to that persona (Automated Insights, Narrative Science, Data2Content, and Arria). Concretely, imagine an ecommerce Web site that gives each customer different product descriptions based on her personality. That’s a step beyond current personalization or recommendation engines, which select the best message or product but don’t change how it's presented or use manually-created variations. It’s also a step closer to what a good human salesperson does, tailoring their presentation to whatever they feel will best resonate with the person they’re talking to. The pieces needed to deliver user-tuned content are all available, although I haven’t seen any one vendor combine them into a single product. Maybe that won’t happen soon enough to the very next Big Thing, but I’m pretty sure it will be a Big Thing in the not too distant future. *I really wanted to call this "smart content", but that's used by HubSpot for something else. "Intelligent content", "responsive content", "contextual content", "dynamic content", "personalized content", "tailored content" and many others are also taken. "User-tuned content" has been used in pretty much the sense I have in mind, although specifically relating to content tuned to the needs of autistic children. Can computers understand an individual human’s personality (and then, presumably, use that understanding to better target marketing messages)? It turns out that’s no longer even a question: if you haven’t yet played with CrystalKnows, be prepared for some weirdly accurate insights into yourself and those you know well, based on public Internet information. And, yes, Crystal advises you how to interact with others based on those insights, going so far as to suggest changes to your emails to better fit the style of the recipient. If there’s a gap between this and letting a computer just manage the whole relationship without any human involvement, it’s almost too small to worry about. So the real challenge isn’t having the computer analyze your data; it’s having enough data for the computer to analyze. People like me, who blog and Tweet incessantly, are easy enough to understand (or, at least, it’s easy to describe our carefully curated public personas). But many of your marketing targets are less visible. Finding enough of them to be useful is a major limitation for systems that rely on machine intelligence to help target marketing messages. This is where Mariana comes in. The whiz-bang part of its pitch is using artificial intelligence (“deep learning” as in the Mariana Trench – get it?) to build personas by analyzing a sample of your existing customers. Users see attributes for each persona such as interests, titles, functions, tenure, and average deal size. Pretty cool, I must say. But the really special part is what comes next. Mariana finds other people who match the personas, using its deep understanding of social data to accurately identify and find contact information on larger numbers of relevant people than other vendors. How many more? Mariana told me that while other vendors might find social profiles on less than 30% of the records on a B2B email list, it regularly finds data on 50% to 80%. The difference is that Mariana uses its artificial intelligence to analyze connections between people – including unique access to the Twitter social graph, as well as where people work or have worked, groups they belong to, and the types of work they do. This helps it pick the right person when several people share the same name and lets it build detailed, accurate profiles ncluding Twitter and Facebook handles, employer, job function, and interests. Of course, it can also assign each person to the correct persona for each client. What does Mariana do with this information? It currently offers two products: Prospect IQ to find new prospects and Conversion IQ to market to names already in the client's database. Both products start by uploading a training set of target accounts or closed and won opportunities and contacts from CRM. The system then does its magic to look up the companies and individuals in that set, find data about them, and built personas based on common clusters of attributes. Clients can build one set of personas for their entire customer base or create separate personas within segments based on company size or industry. You can call this Account Based Marketing if you like; Mariana does. 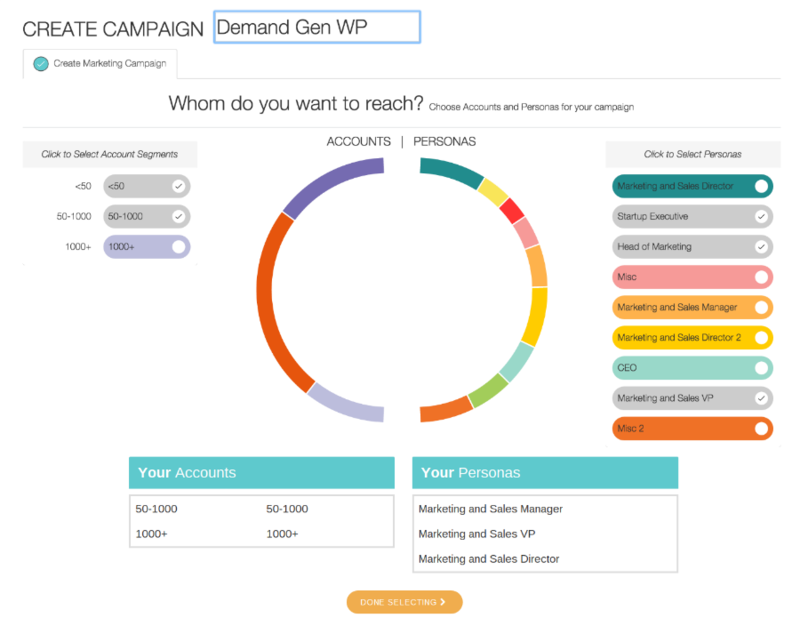 For Prospect IQ campaigns, users can define a target audience based industry, company size, location, and persona. The system then returns contact counts for Facebook, Twitter, and email. Users create the marketing messages, helped by Mariana’s suggestions for which topics would interest each persona. They then choose which personas get which messages, set a budget and timeframe for each channel, and let Mariana execute the campaign. The system will send message to the same person in multiple channels when possible and can run automated a/b creative tests to optimize results. Responses go to a user-specified landing page; Mariana does not reveal prospects’ identities unless they respond. Conversion IQ follows a similar process except that Mariana works from a set of known contacts uploaded by the client. 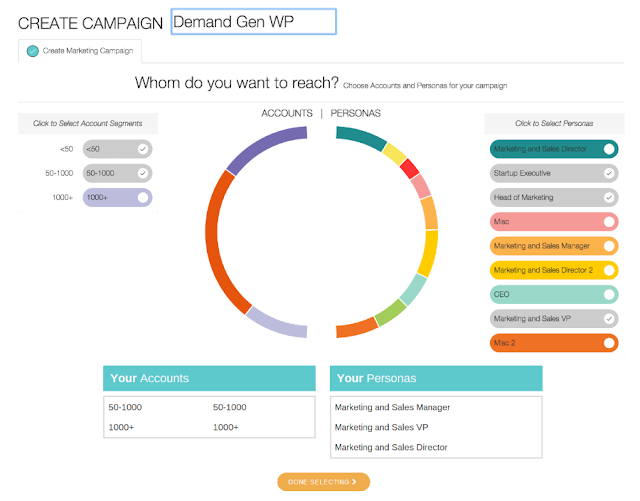 These are cleaned, enhanced with company and individual data, and assigned personas. Users then define campaigns and have Mariana execute them. Mariana has prebuilt integrations with Twitter, Facebook, Salesforce.com CRM, Pardot, Eloqua, and Marketo. Pricing for Mariana is based on the number of campaign responses. It starts at $3,000 per month for a three month pilot, which includes the cost of advertising media at specified CPMs. The company was started in 2013 and officially released its product on March 1 of this year. It reports that pilot projects during the test stage yielded ten times the conversion rate of conventionally targeted ads. I spent part of last week at ICON16, Infusionsoft’s annual combination of customer conference, revival meeting, and group therapy session for small business owners. The company made a few announcements, most notably a vastly improved email builder and tighter integration with online accounting software from Quickbooks Online and Xero. These changes were evolutionary at best, but company leaders made clear this was on purpose: their current strategy is to make small improvements to ease of use, not add major new or deeper features. This is based on Infusionsoft’s learning over the past ten years that the main barriers to success with its software are small businesses not knowing what to do with it and not seeing immediate value from the efforts. The real focus of the conference was introducing the latest version of Infusionsoft’s Small Business Success Method, an approach to helping small businesses plan their marketing programs. Infusionsoft’s goal is to bake as much as possible of the methodology into the software, its partner ecosystem, and prebuilt assets such as campaign plans. This all makes perfect sense and is wholly consistent with Infusionsoft’s historical focus on helping small business grow. Although the company’s growth slowed a bit in 2015 (customers up 30% to 35,000; revenue up 25% to $100 million) CEO Clate Mask said the management has recently committed to a goal of five million customers by 2030. This is certainly audacious – it implies growing 40% per year for 15 years in a business that is highly prone to disruption – but big long-term goals are part of Infusionsoft’s culture. Whether it’s realistic is another question. Some companies serving small business have indeed reached multi-million client counts (see table), but their products cost much less and are essential for basic operations. ** Infusionsoft’s challenge is to convince a large fraction* small business owners that their product is also essential. I still think Infusionsoft could be displaced by an aggressive, well-funded competitor, especially as marketing technologies and methods continue to change.. Infusionsoft argues that their partner network is a competitive barrier that would be hard for another software vendor to overcome. This is true to some extent but Infusionsoft doesn’t dominate among marketing agencies in the way that Intuit Quickbooks dominates among accountants. Nor are many of the tiniest businesses ever going to use a marketing agency. Similarly, Infusionsoft's existing customer base provides invaluable data to help machine intelligence systems make recommendations, but other firms could use data from fewer customers in similar ways. Infusionsoft also argues, I think correctly, that very small businesses are harder to serve than even slightly larger ones, because the smallest business owners have so many other priorities and often so little interest in marketing. This makes channel partners, methodologies, and client support even more important – making Infusionsoft’s head start in experience, methodology, and partner network harder to overcome. Of course, the only people who really need to worry about Infusionsoft’s business prospects are its investors and employees, although channel partners and clients do have some stake in the results. So let’s move on to the fun stuff, which is technology. As usual at these conferences, I spent a good chunk of my time cruising the exhibition floor for interesting new vendors. One booth was staffed by attractive young ladies in dark glasses and tight-fitting police uniforms, which literally gave me nightmares. Adding insult to injury, their company provided small business financing, which isn’t even of interest to me. Among the more relevant firms, I noted a high concentration of reporting tools, including freshlime, hipdash, cloudlink, graphly, and Wicked Reports. These address a recognized gap in Infusionsoft’s own reporting, particularly regarding visualization, custom reports, and integration of external data. Of these, I found WickedReports the most interesting: they use customer tracking to do multi-channel lead attribution and customer value analysis. According to the person I spoke with – who was fortunately not wearing a police uniform – they actually track all contacts with each customer, meaning they have the data to assign fractional credit to each touch using advanced statistical methods. But they don’t expose that data, having judged that Infusionsoft customers aren’t ready for anything so sophisticated. I’m pretty sure they’re right. Two other vendors also caught my eye. ThinkingChat promised "artificial intelligence lead capture agents" engage site visitors and capture contact information. I was a bit disappointed to find that what they really do is scan for keywords in the chat inquiries, and then provide fixed responses. That's clever but a very low grade of AI at best. Keywords alone have major limits – “price is too high” “price is a bargain” or “what’s your price” would all trigger the same reply if the system simply looks for the word “price”. ThinkingChat adds a bit more flexibility by letting users use a keyword to direct the dialog to different collections of keywords and answers, for example to give prices for different products if a product name is mentioned first.It will also recognize when a visitor is having a problem and admit it can’t answer a question, although the user must manually review the failed dialogs to make refinements. On the other hand, ThinkingChat reports that it more than doubles the rate of capturing contact information on their clients’ Web sites, which is a pretty good deal for as little as $149 per month. So it's worth a look. My favorite product by far was DilogR, which provides interactive content including assessments, quizzes, and surveys; dynamic videos that let users choose which sections to view; and interactive images. This puts them in competition with firms like SnapApp, ion interactive, Survey Monkey, and Brightcove but at a fraction of the cost: DilogR plans start as low as $97 per month. I think interactive content is an extremely important tool for engaging prospects, but have been frustrated at the time and cost it has taken my own clients to deploy it. DialogR could open this up to many more marketers, providing value for their businesses and customers alike. I'm glad I found it. * There are just over 5 million small businesses in the U.S. with employees plus about 15 million companies with no employees and at least $10,000 revenue. The total market is larger because Infusionsoft can also sell to companies outside the U.S..
** To put this in perspective: five million clients at $3,000 per client would give Infusionsoft $15 billion revenue, ranking it just behind SAP as the worlds fifth-largest software company and nearly three times Salesforce.com's 2016 revenue of $6.67 billion. *** One possible inference is that Infusionsoft would need a much lower-priced offering to reach that many customers. Company managers did seem to be giving this some thought but it would conflict with their strong position that only business owners willing to invest serious time and effort in marketing would succeed with their product. ***Note also that Salesforce.com is just two years older than Infusionsoft; by the time it had reached Infusionsoft's current age, its revenue was already $4 billion. Even if you count from Infusionsoft's first venture capital funding in 2007, Salesforce.com had $500 million revenue at the same age. In other words, Infusionsoft is growing much more slowly than Salesforce.com. That's not surprising: small businesses are slow adopters and Infusionsoft faces more competition than Salesforce ever did. But it's hard to imagine Infusionsoft ever matching Salesforce.com's growth rate.